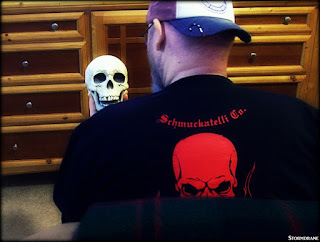 Stormdrane's Blog: Time for a Schmuckatelli Co. Giveaway! *Entry period now closed. Time for a Schmuckatelli Co. Giveaway! *Entry period now closed. 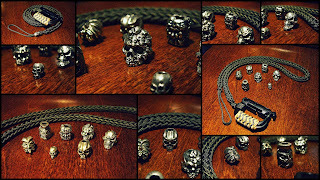 Mike at Schmuckatelli Co. sent me a package of Made in the U.S.A. goodies (skull lanyard beads!) 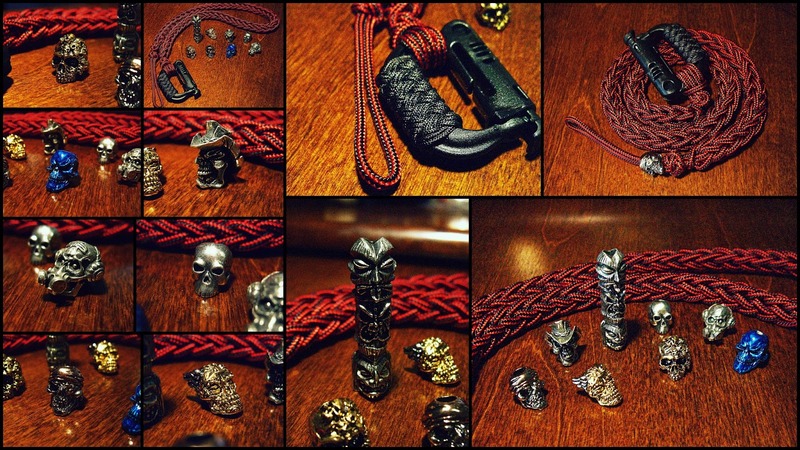 from his packed desk drawers, with some prototype finishes, including a cool proto totem (all one piece) of stacked Tiki beads (Kiko, Ona, and Ku) and a selection of other beads from their lineup. This giveaway is sponsored by Schmuckatelli Co., and Stormdrane. 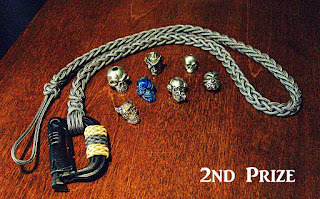 I've split the skull beads up for three winners: 1st, 2nd, and 3rd prizes with a lanyard that I tied for each prize package, so the winners can have a lanyard to add a bead to, or add them to ones they tie themselves. Don't know how to tie a lanyard? 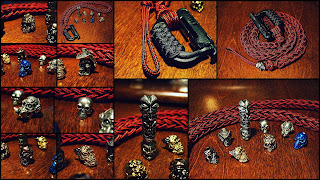 I encourage folks to get some cord, learn some knots, and have some fun maybe trying/tying something out of their wheelhouse and dress it up with some cool skull beads. 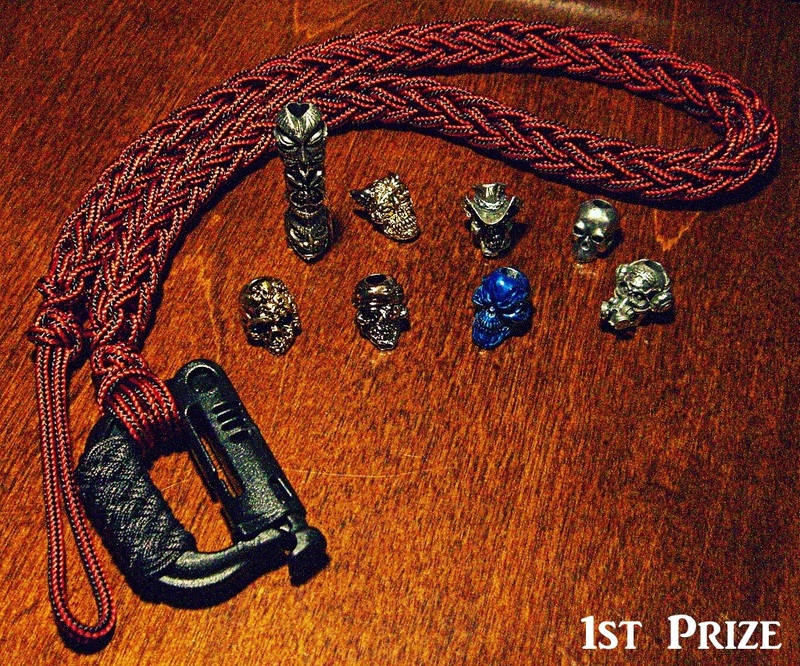 The 1st prize includes a 425 paracord spool knit lanyard, in licorice (black/red combo) with a 4 bight Turk's head knot on the Grimloc carabiner. 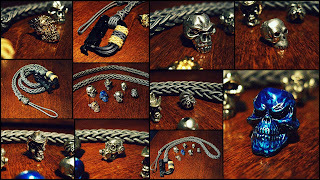 The beads include the proto pewter Tiki totem, 18 karat gold plated Mind skull, proto finish rhodium and 18 karat gold plated Aquilo Sugar Skull Bead, 18 karat gold, rose gold, and rhodium plated One-Eyed Jack, blue powder coated Grins, pewter Brous bead with logo, pewter Vinnie Garoon Cowboy Bead, and pewter Classic skull bead. 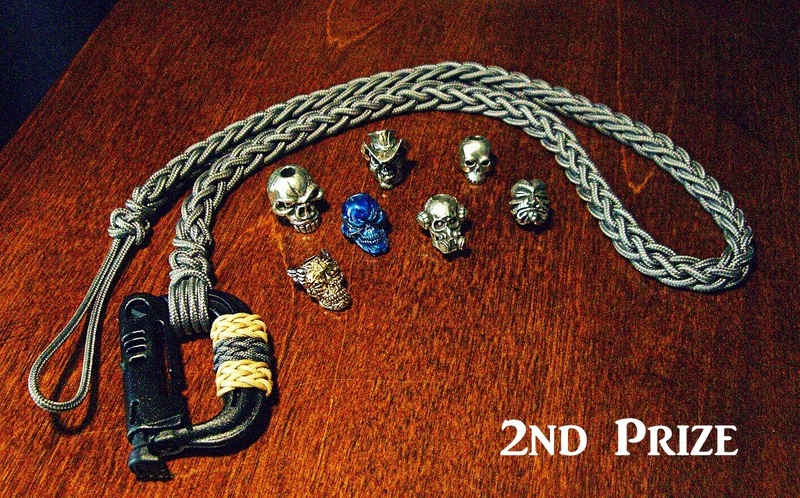 The 2nd prize includes a 325 paracord (I think that's what the size/diameter is, wasn't labeled, lol) spool knit lanyard, charcoal gray, with 1.4mm cord gaucho interweave knots on the Grimloc. 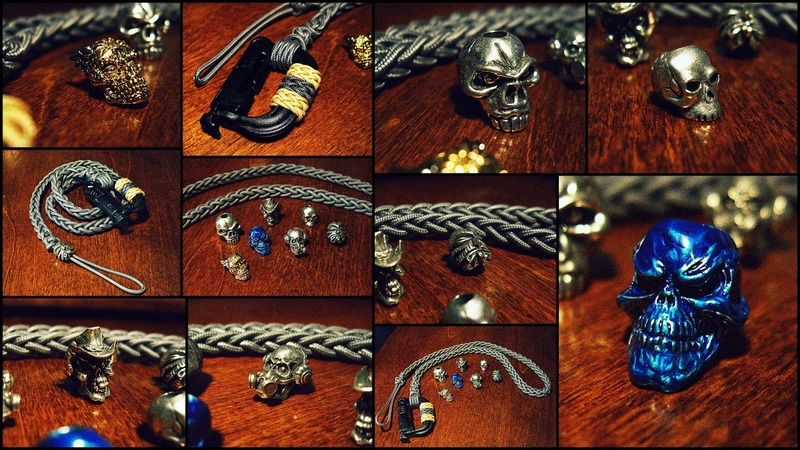 The beads include a proto finish 18 karat gold and rhodium plated Aquilo Sugar Skull Bead, blue powder coat Grins, pewter Jumbo Emerson, pewter Vinnie Garoon Cowboy Bead, pewter Classic skull bead, pewter Brous no logo, and Kiko Tiki bead. 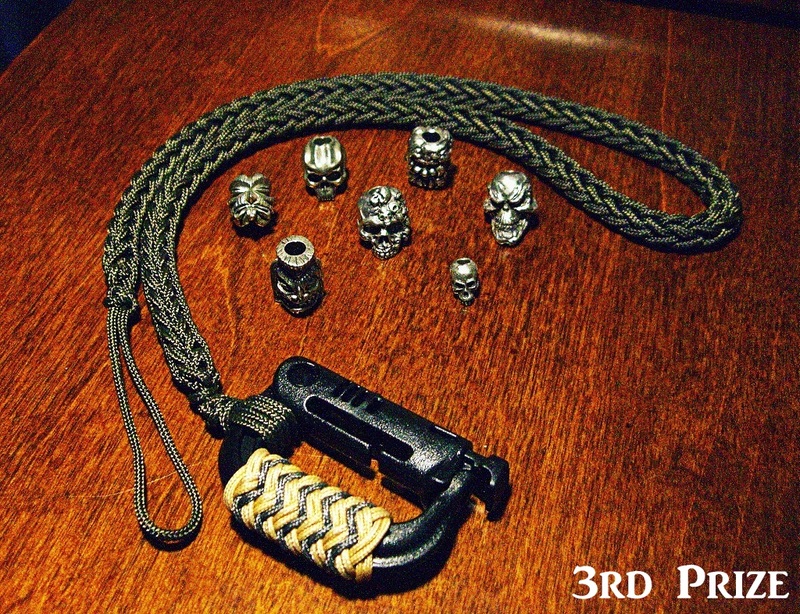 The 3rd prize includes a Type I/95 paracord spool knit lanyard in olive drab, and the Grimloc has a 1.4mm cord pineapple knot tied on it. 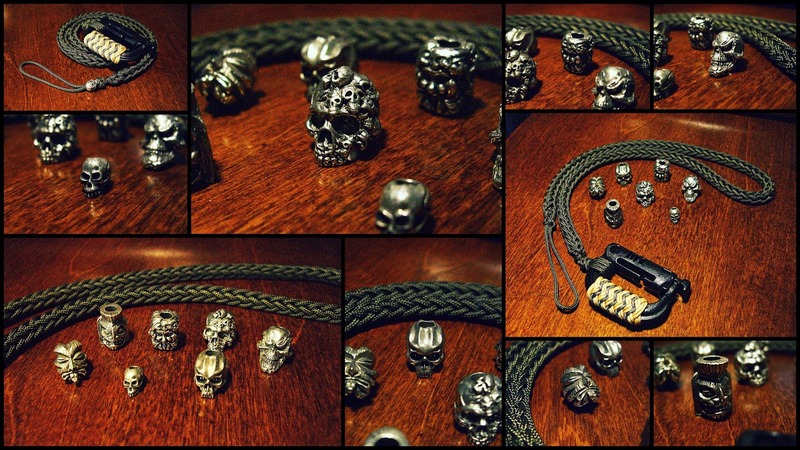 The beads include pewter Kiko, Ku, Grins, Mind, Cyber, Joe mini bead, and Green Man. Giveaway entry period is from 6 November 2017 through 12 November 2017. To enter, leave a comment with your name and location AND the title of the last book you read on this blog post (first/last name, your city/state/country location AND book title), which helps tell one entrant from another if they have the same name. Example: David Hopper, McDonough GA, The Directory of Knots. One entry per person, and I'll open this giveaway to U.S. residents and international entrants also, but if someone outside the U.S. wins a prize package, they agree to be responsible for any taxes or customs duties and accept the risk of packages disappearing in the mail, which can happen in the states at times as well, but luckily I've had no problems with packages I've mailed out at home or abroad not ending up where they were supposed to. At the end of the giveaway entry period, names from the pool of entrants will be drawn and the winners names will be posted, and they will have one week to reply/respond, or alternate winners will be chosen, so be sure to check back after the giveaway ends to see if you've won. Spam links in the comments will be deleted. After contact with the winners has been established, their prize package will be mailed out to them from my location here in McDonough, Georgia. Good luck to all and happy knotting! Some of these beads are one offs, so there are no replacements. Monetary value is hard to determine as well, but you can get an idea if you look at similar finishes with the different beads that are currently offered on the Schmuckatelli Co. website. 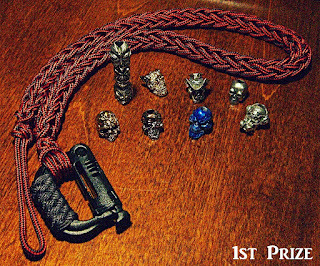 My best guesstimate on value for each prize package, based on similar beads on the site and cost of materials for the lanyards I tied (not counting the time/ hours spent tying them) is approximately: $80 value for 1st prize, $65 value for 2nd, and $50 value for 3rd prize. No substitutions for prize packages. 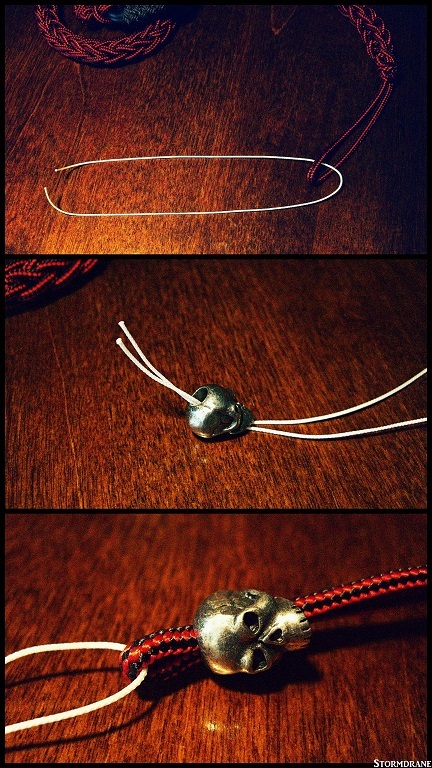 And a few simple photos showing how to get those lanyard beads on to the lanyard loop, and sometimes fit the lanyard loop through a knife/flashlight/multitool lanyard hole, size permitting, as not everyone may know how. Take a thin piece of string, fishing line, or dental floss through the lanyard loop, bring the ends together, then run them through the lanyard bead, and pull the loop up through the lanyard bead with one hand and push down on the bead with the other. A loop of paracord can be a tight fit for some beads depending on the thickness of the cord and the diameter of the lanyard bead's hole. 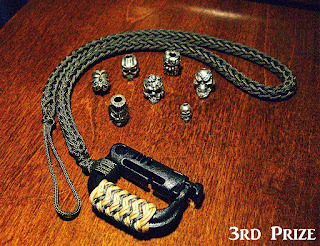 Not all paracord is the same. Sometimes the paracord may need to be gutted (inner strands removed) to make it thin enough to fit beads and lanyard holes, experiences can vary when buying cord from one vendor/distributor/manufacturer compared to another. Cheapest is not always best, shop around. Here I sit, contemplating what to eat, pizza or tacos, sporting a Made in the U.S.A. t-shirt that Schmuckatelli Co. sent me. Even had one in my size, a 'Put the fork down!' size, one of those with lots of X's, lol. Jon MacDonald, Victoria BC Canada, "Paddle Your Own Canoe" by Nick Offerman. Ashley Wilkin, London, United Kingdom. #4 in The Dagger And the Coin series. William Parenio, Kapolei Hawaii Book "Rocky and Kaimana"
Dave Macauley, Cleveland GA, USA I can't remember the last time I read a book to be honest with you. But I want to read The Reaper by Nicholas Irving and he has a new one out. Mark Keenan, Greenville SC USA, American Sniper. Patrick Garcia. Albuquerque,NM,USA. Killing Lincoln. Raymond Gardner, Cincinnati Oh, We Were Soldiers Once… And Young. Luke Hill, Minneapolis, MN, "The Martian"
Ben in TN. FasTrack to your general ham radio license. Joe Mendoza, El Centro, CA. usa " The outsiders"..
Clynn Korney Hampstead, NC “ The Book of Five Rings”. "The Zynq® Book Tutorials for Zybo and ZedBoard"
Minstrel C. Stumptown, OR. Sharper Than a Serpent's Tooth. Jimmy Daniels, mount Sterling Kentucky, mind hunters book. Marc Gigliello, Melville New York, “ Give Me A Fast Ship, The continental navy and America’s revolution at sea by Tim McGrath. Todd brown, Liberty Hill, TX USA, Why knot? Lane Martin, Arab, AL. "Grain of Truth: The Ancient Lessons of Craft"
Brandon Pisani, Albuquerque, NM. I, Robot by Isaac Asimov. Thomas Reagan, Doe Run, MO "Stillhouse Lake"
Brian Knollenberg, Windsor, CO "Killing Kennedy: The End of Camelot"
Can't believe it's been over 10 years since your Paracord Lanyard Project blog post (Feb '07), but that was the first paracord project I tried to emulate. Thanks for all your great work over the years! Entry period for the giveaway is now over. Once I've drawn the winners, I'll post again with contact info for the winners for verification and get their prizes mailed out to them. If the winners do not make contact within a week, alternate winners will be drawn. Thanks! Winners drawn and listed in new blog post!